There is a little known story written in the 1950s by author Isaac Asimov which was, perhaps, one of the first books to ever talk about machines thinking on their own, before robots were even a blip on the technological radar. The robots in the book go crazy due to contradicting commands, as they are essentially machines with a mind of their own. It takes a robopsychologist to figure out the bugs in their system and fix them. At that time, robots were a figment of a sci-fi writer’s imagination, but now they are a reality. While we are nowhere near the situation of crazy automatons, the age of robots has certainly arrived. 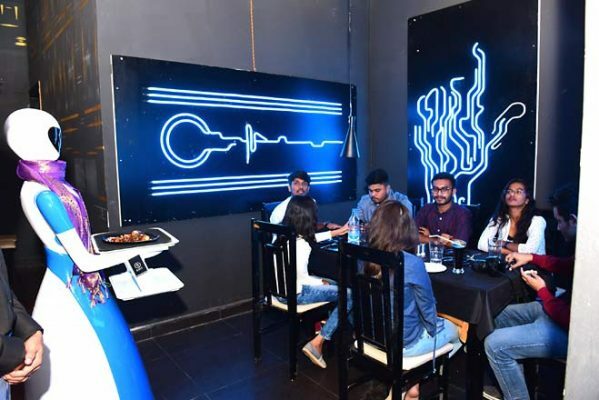 Hyderabad now boasts of a restaurant where the waiters are robots. And its owners are brimming with pride over having achieved their futuristic vision. “They are powered by artificial intelligence, and are programmed to reach the right table through sensors. It’s not just the novelty, but they also improve productivity significantly. However, they are serving models and don’t speak. But, the day is not far when interactive robots will become the norm in India as well,” says Prasiddh Sethia, co-partner, Robo Kitchen, which has four serving robots on its staff. There is a very big novelty value attached to having a robot deliver your meal, and if speaking robots come to India, the waiters may well become a relic of the past. Or, maybe not! Robots have become ubiquitous today in their different forms. Abroad, they are being used extensively in industries such as food processing, packaging, car assembly lines, medical field, space research, military, and agriculture, to name a few, often in the form of a programmable automated arm. Closer home, such technology is currently being used in medicine, construction, farming and car assembly lines. At Yashoda Hospital in Somajiguda, Dr Sachin Marda, senior surgical oncologist and Robotic surgeon, performs surgeries using robotic arms, otherwise known as the da Vinci Surgical System. 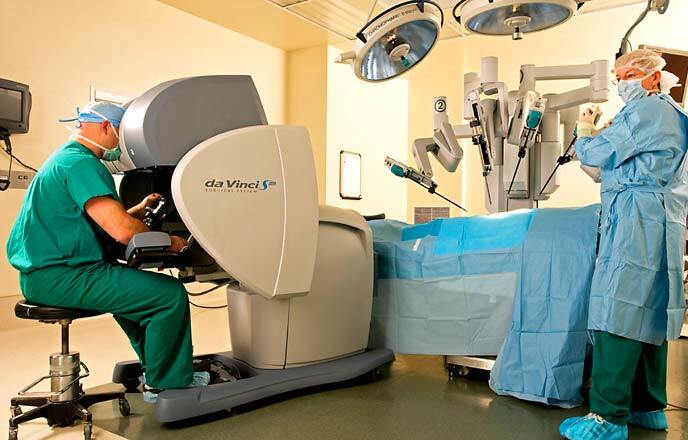 “There is a patient-side cart and a surgeon’s cart which has a console that controls two-three robotic arms. During the surgery, the robotic arms and camera are inserted into the abdomen or thorax of the patient depending on what type of surgery it is. The surgeon has 10x magnified view which can’t be seen by the naked eye otherwise. Unlike a human wrist, the robotic arm can rotate in any direction, there is no limitation. The precision improves drastically and the surgeon doesn’t need an assistant’s help here,” explains Dr Sachin. At present, such robotic arms are being used to perform prostrate surgery, rectal surgery, removing oesophageal tumours, lung tumours, and for cervical or uterine cancer. And the robotic arms have to be programmed to perform a specific type of surgery; one size doesn’t fit all here. 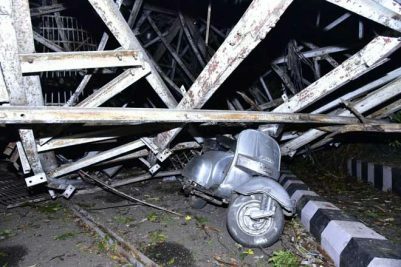 The cost of such systems is also not a walk in the park, 3rd generation robotic arms cost Rs 15 crore and have to be replaced after performing 8 to 10 surgeries, which is a tremendous undertaking for a hospital. Robotics is also proving to be a great way to break down subjects like science, mathematics and engineering owing to the practicality. 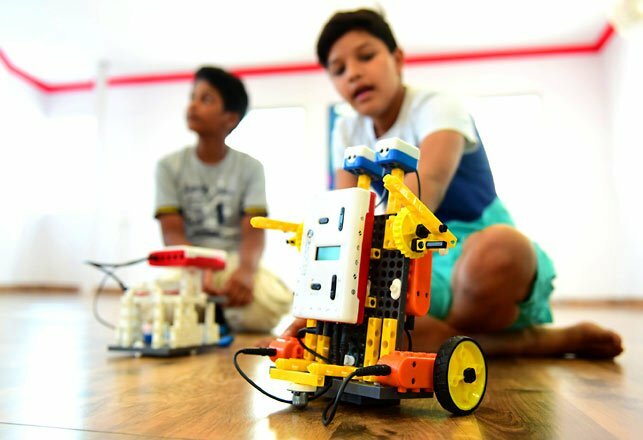 City-based Leap Robots is trying to encourage children to build such technology from the ground up, by teaching them the basics of robotics. “Robotics makes it easy to introduce programming into education. We bring small bots to classrooms where we show students how the motor and actuators work, tell them about machine language, algorithms, and encourage them to come up with their own models. By seeing what works and what doesn’t, they learn the limitations of the technology,” says Satyanarayan Makela, CEO, Leap Robots, which currently has six research labs in the city. Their demographic is a cool mix of second standard students, IT professionals and PhD scholars working on a range of topics under the broad umbrella of technology. 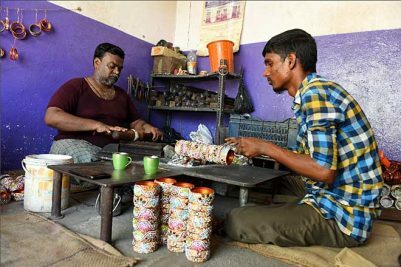 Popularly portrayed as crazed automatons in literature, authors have often highlighted the emotionless aura of such machines which will one day replace manpower. But, those in the field are of the opinion that it is a long way off. “A majority of such technology is still in research labs being tested. Purpose-oriented robots being used in industries are good for repetitive work, as every movement is performed in the same way. There is no variance. But, even today, how many factories are fully automated? There is a lot of scope in manufacturing and software testing for them. But, it costs a lot of money and these robots are going to be value-based and very target-specific,” says professor Ramesh Loganathan, head of research outreach and also working on artificial intelligence at IIIT-H. Cost and many challenges in programming of the AI are two areas which are a major concern for those in the industry. A while ago, H-Bots Robotics had come out with their ambitious prototype of a ‘robocop’ in the city which would have the ability to file complaints, record audio/video clips, identify suspects, detect metals, and monitor crowds. But, so far, nothing has happened in that area. Literature and cinema have long since been one step ahead in creating fantasy worlds where anything is possible. In literature, robots made an appearance in books like 1868 novel The Steam Man of the Prairies by Edward S Ellis which introduced steam-powered androids that took its creator, a young boy on adventures across America. The automaton imagined by author Lester del Rey was called Helen in his short story Helen O’Loy published in 1938. It was the first book to mention a domestic robot whose creators end up falling in love with it, a storyline eerily similar to 2013 movie Her starring Joaquin Phoenix. Authors Isaac Asimov and Karel Capek created robots who destroy humanity. Imagine a setting in future where humanoid robots created to serve humanity turn hostile and take power from humans like in i,Robot. The scary scenario apart, who can forget the lovable and highly loyal R2-D2 from Star Wars, the cute Wall-E or the sarcastic TARS from Interstellar who showed us that even robots can work around their programming and show some degree of ‘feelings’. 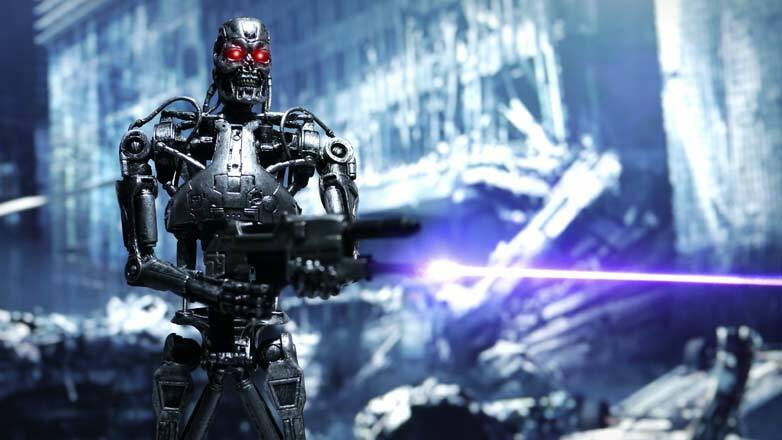 James Cameron’s robotic creation T-800 in Terminator became humanity’s greatest defender and was made immortal by Arnold Schwarzenegger. At the end of the day, they may be machines, but they are a reflection of our dreams. A common fear that goes hand-in-hand anytime we mention robotics is they will take away our jobs. But, they may replace tasks, not jobs. As top tech companies race against each other to get their hand on AI-powered technology, the future looks pretty exciting. Already there is talk of policing robots which will be able to detect suspicious behaviour, allowing cops to act quickly. Personalised teaching can get a tremendous boost through humanoid robots such as NAO which is quickly forming bonds with children around the world. Homes and hotels will get household robots which can clean, cook and wash up, reducing human effort. In Japan, a humanoid robot is in the works which may do away with the front desk personnel. Pharmabotics will be like ATMs of medicines, so human beings don’t need to go to a store to buy them. Talk is that primary healthcare may also witness robots performing tasks like checking a patient’s condition with stethoscopes, interacting with patients, and evaluating the need for further appointments. While this technology is still being tested on a small scale in India, countries such as Japan, South Korea, Singapore, Germany, Sweden, Denmark, the USA, Italy, Belgium, and Taiwan have entered the future with a large percentage of robots working across varied industries. Welding robots have helped human workers avoid hazardous fumes and arc burns that come from the application intense heat that is generated when connecting metal parts in steel production and automobile manufacturing plants. While welding, assembly, picking and packing robots are the most common types of industrial robots, these countries are also using them to perform other tasks in isolated and insulated environments. Sectors such as aerospace, electronics, textile industries use water-jet robots to cut, drill and clean a variety of materials. Milling, drilling and cutting robots are common in CNC industries, in tooling and prototype development. Mining industry is also utilising the perks of these machines by sending them for reconnaissance and get information about the interiors of a mine, paving the way for a safer work environment for human miners. While robots are still predominantly seen in the automotive industry, it won’t be long before they penetrate every type of industry.